While the benefits of diversity are well-documented, entrepreneurs from underrepresented backgrounds continue to face persistent barriers limiting their access to networks, funding, and education. This panel discussion will feature inspiring founders and leaders who are developing innovative approaches to complex societal challenges and building the entrepreneurship ecosystem needed to create a more inclusive economy. 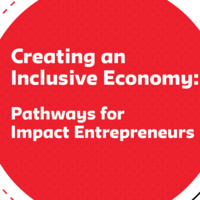 This event is organized by The New School’s Impact Entrepreneurship Initiative (IEI), which is supported by the Ewing Marion Kauffman Foundation.